What exactly is the navigation channel adjustment? The navigation channel, i.e. the part of the Elbe River used for maritime navigation, is to be deepened from Hamburg to the mouth of the Elbe and widened in some places. 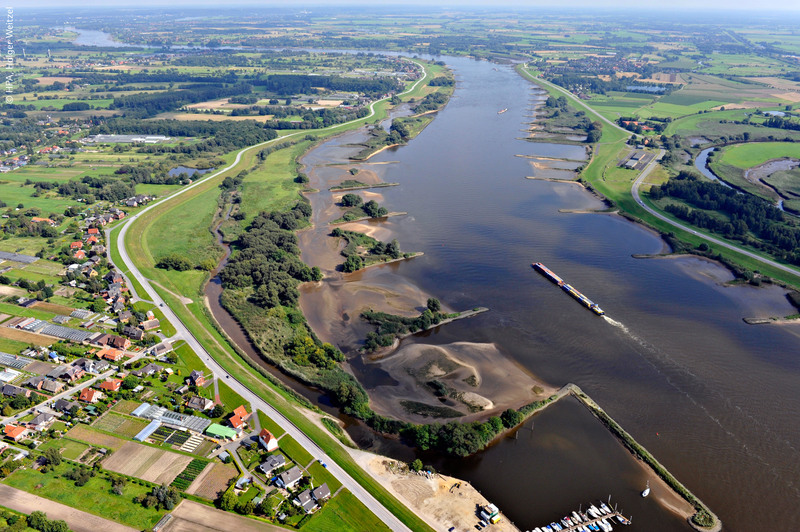 In contrast to all previous deepenings of the Elbe fairway, this time there is an extensive river-engineering concept to dampen the force of the tides and thus prevent major changes in the current and water levels. To this end, the dredged material from the Elbe bed will be used to erect several underwater river-engineering structures. The adverse effects on the environment caused by the expansion will be offset by extensive ecological compensatory measures. In a long-term evidence-preserving programme, experts will continuously record and evaluate the condition of the water body, including the plant and animal species living there. Why is the navigation channel being extended? To enable inbound and outbound ships to pass each other more easily, the navigation channel will also be widened in some places and a special passing box created for especially wide vessels, thus reducing or even eliminating waiting times. Who is implementing the navigation channel adjustment? 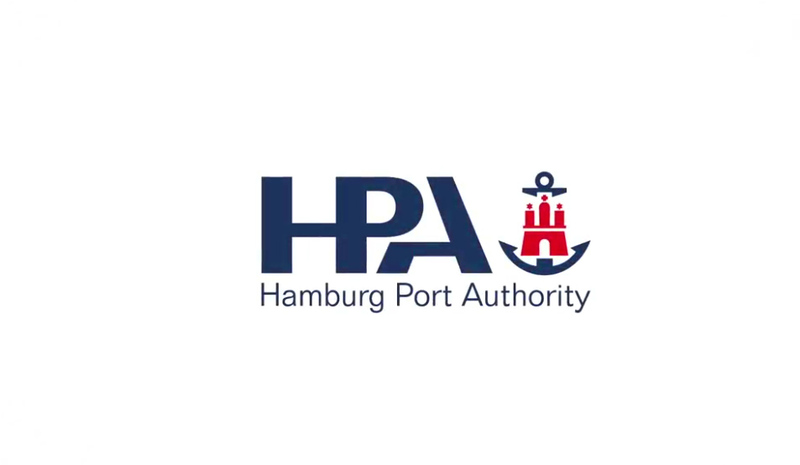 The extension of the fairway is a joint project of the HPA and the Federal Waterways and Shipping Administration (WSV), represented by the Hamburg Waterways and Shipping Authority. The section to be upgraded by the HPA stretches from the state border at Wedel almost to the St. Pauli fish market on the Norderelbe (Northern Elbe) and to the Altenwerder container terminal on the Süderelbe (Southern Elbe). Downstream from the Hamburg state border to the mouth of the Elbe, the navigation channel will be extended by the WSV, which is responsible there. HPA and WSV are working closely together in planning and implementation. What construction measures are being implemented in Hamburg? In Hamburg, the fairway adjustment project consists of four subprojects. 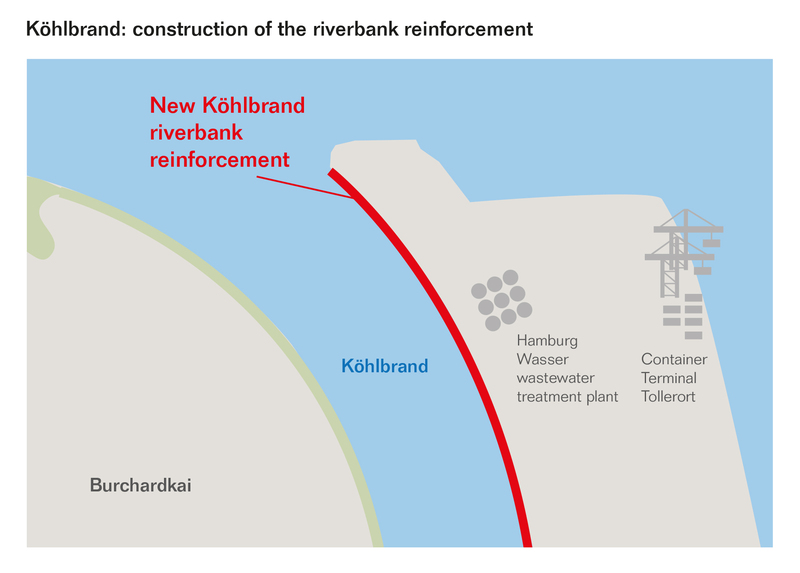 In addition to dredging the Elbe, these include construction of a riverbank reinforcement on the east side of the Köhlbrand, relocation of the Blankenese leading light line and the renewal of a culvert between the Falkenstein bank and the Elbe island of Neßsand. Which measures will be implemented by the WSV from the Hamburg state border to the mouth of the Elbe? On the stretch behind Hamburg’s state border, the Elbe will be deepened and widened in parts by the WSV. 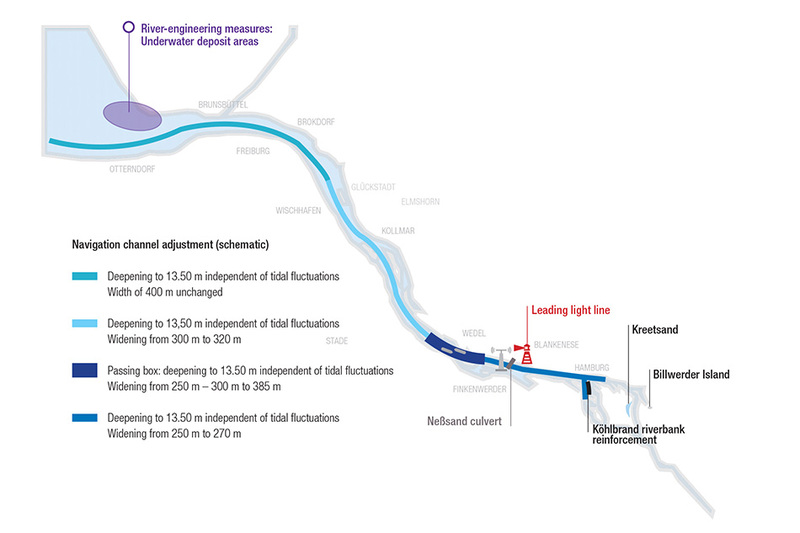 The river-engineering concept foresees the erection of several underwater structures in the Elbe estuary area, which will use the dredged material from the navigation channel adjustment. These will dampen the force of the tides and thus prevent major changes in current and water levels. In addition numerous compensatory measures are planned along the federal section – six in Lower Saxony and nine others in Schleswig-Holstein. Where can I obtain information about the history of the project? Under “navigation channel adjustment” in the download centre you will find all documents of the planning approval procedure as well as the project history document with an overview of the approval procedure. What depth will be dredged? In Hamburg, the target depth of the navigation channel will be increased from a mean sea level of 16.70 metres today to a mean sea level of 17.30 metres west of the new Elbe tunnel and a mean sea level of 17.40 metres east of the new Elbe tunnel. What width will be excavated? The navigation channel, which today is between 200 and 250 metres wide in Hamburg, will be widened by 20 metres in some sections. What is the passing box? In addition, a passing route will be created between Blankenese and the state border. There, the navigation channel will be widened to 385 metres to allow large inbound and outbound ships to pass each other safely and easily. Where is dredging to be done? Since the Elbe River is of different depths at different points, it is not necessary to excavate the entire area when deepening the river. On the basis of sounding data, the river bed will be removed where necessary until the new target depth is reached everywhere. What will the dredged material be used for? The dredged material of the navigation channel adjustment will mainly be used for the construction of underwater structures in the Elbe estuary which are effective in terms of power engineering. These underwater sedimentation areas will be created as ground sills where no great water depth is required for shipping. They will dampen the force of the tides flowing in from the North Sea, thus avoiding larger changes in currents and water levels caused by the expansion of the fairway. What is a leading light line? 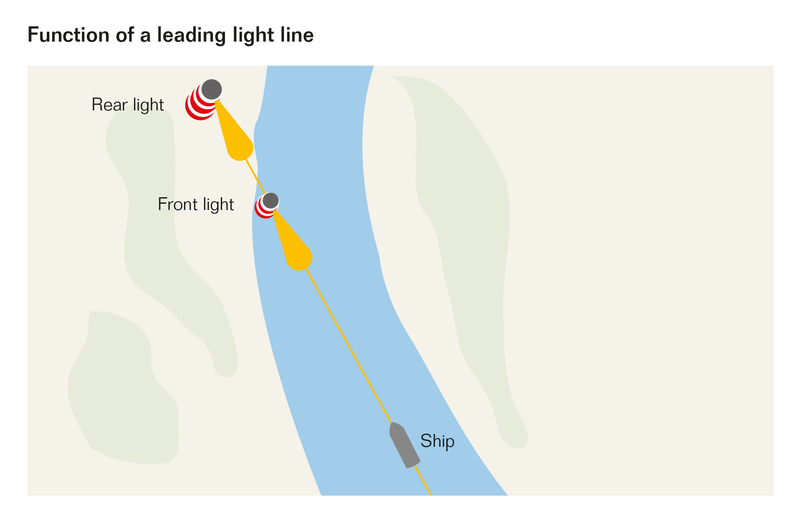 A leading light line serves as an orientation aid for ships. It consists of two lighthouses, the rear light and the front light. If both towers or their white flashing lights are in line one behind the other at night or in poor visibility, the ship sails in safe waters. As a rule, leading lights indicate the middle of the fairway. Why does the Blankenese leading light line have to be rebuilt? Ships entering the port of Hamburg follow the Blankenese leading light line. 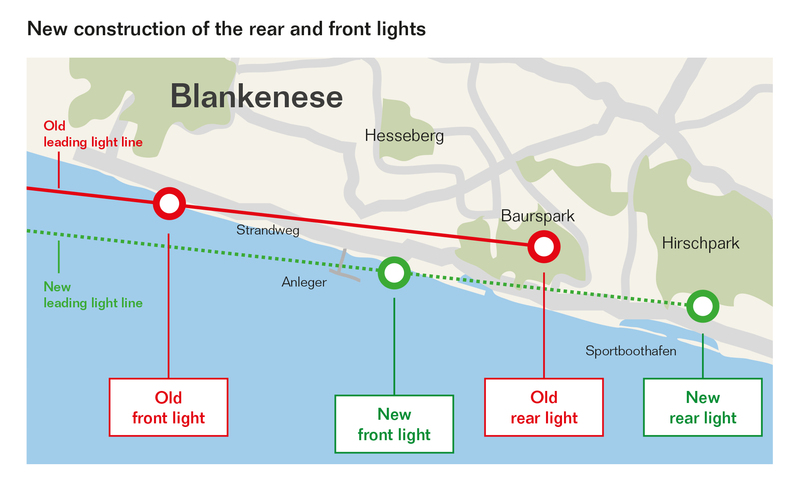 As the course line for incoming ships will shift to the south in the course of the navigation channel adjustment due to the construction of the passing route, the leading light line in Blankenese will also have to be further south in future. What will happen to the old lighthouses? Once the passing route is in operation and the new lighthouses are functional, the old towers will be dismantled immediately. This is necessary to avoid confusing the new towers with the old, decommissioned towers. The viewing platform of the old front light will remain intact. Where will the new lighthouses stand? The new tower of the front light will be built on a platform in the water next to the Blankenese jetty, the new tower of the rear light will be erected on a green area next to the Mühlenberg sports boat harbour. Why is it necessary to reinforce the bank at Köhlbrand? 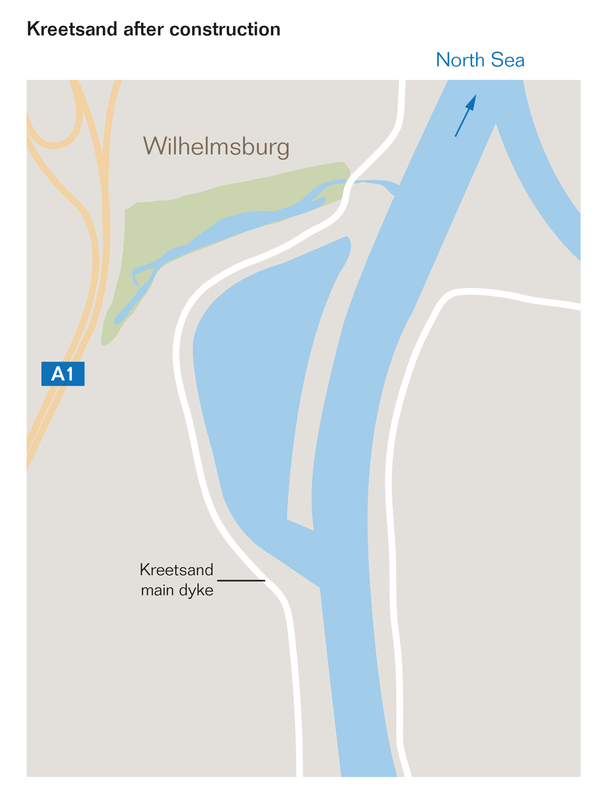 As an important access route to the container terminals, the Köhlbrand navigation channel is also being deepened. Since the Köhlbrand is much narrower than the Norderelbe, a deepening of the current route would make the gradient from the shore to the fairway too steep. 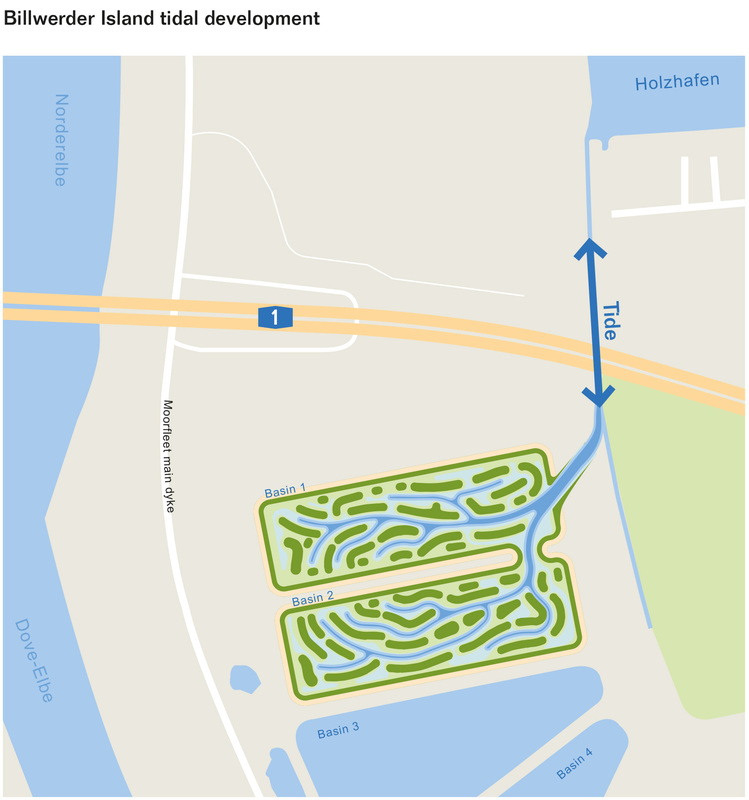 So that the bank only has to be secured on one side of the Köhlbrand, the navigation channel will be shifted 15 metres to the east and the eastern bank will be reinforced. This will ensure the stability of the shore in the Köhlbrand even after the deepening of the navigation channel. 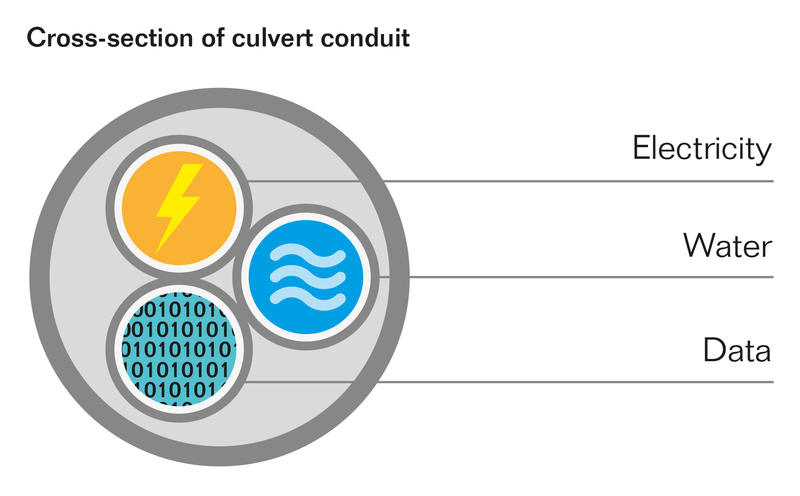 A culvert is a pipe-like conduit used to cross under a road, a river or railway tracks. In a culvert, liquids and gases can be transported or cables laid. In order to compensate for adjustment-related losses of valuable habitats adapted to the tidal conditions and of the water dropwort, which is only found in the tidal Elbe, ecological upgrading measures are being carried out at three locations in Hamburg. On Billwerder Island, south of the Holzhafen nature reserve, there are four former Hamburg waterworks sedimentation basins that were decommissioned in 1990. The two northern basins will be converted into tidal areas so that the protected plant species water dropwort can grow there. The areas will be connected and designed with tidal creeks and tidal flats. In addition, woodland tidal flats will be created on which alluvial forest can grow. The tide will flow in from Holzhafen. The Zollenspieker nature reserve is located on the northern bank of the upper tidal Elbe in the district of Hamburg-Bergedorf. There, an existing tidal inlet will be deepened, widened and extended in length. In future, the new tidal channel will be linked to the Elbe on both sides and the tide can flow in and out unhindered. In addition, artificial bank reinforcements will be partially removed and small bays (“Schlenzen”) will be created there. In places, the elevation profile of the nature reserve is to be altered in such a way that aquatic ecosystems adapted to changing tidal conditions can spread better. The aim of the measure is to create a multifaceted structured habitat, characterised by intensive interlocking of water areas, tidal flats and irregularly flooded land areas. The expansion of the tidal channel will create further possibilities for the water dropwort to establish itself. In addition, the measure ensures that the rare and protection-worthy tidal alluvial forest can spread. 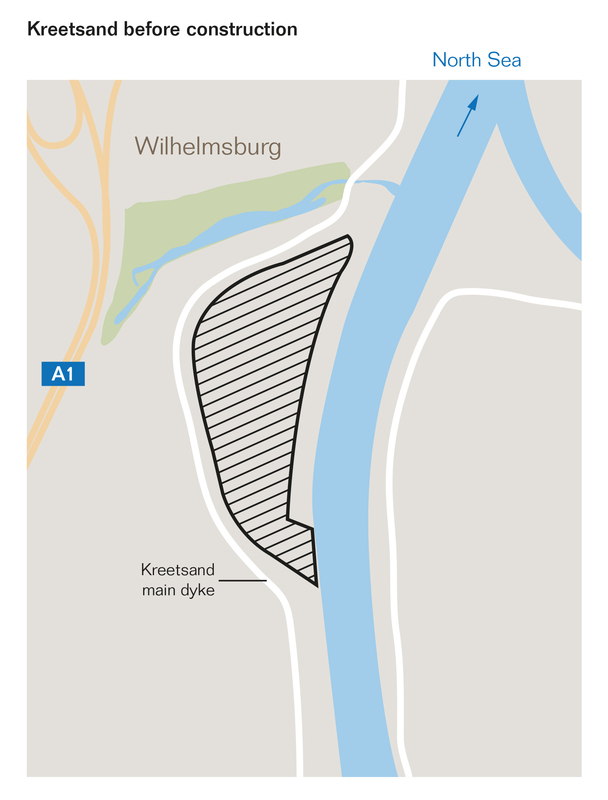 In order to dampen the force of the tides and thus sedimentation in the port of Hamburg, a floodplain will be created east of Wilhelmsburg. This will provide more flood space for incoming water in the future. For this purpose, a large part of the already dyked former Spadenlander Busch / Kreetsand sludge pond will be dredged again. The tide will be able to flow freely into and out of the 30 hectare shallow water zone. This will create an additional tidal volume of around one million cubic metres. This then tidal area will also offer optimal growing conditions for the water dropwort.